Step 1: Remove labels and thoroughly clean containers with warm soapy water. Rinse well. Make sure they are completely dry. Step 2: Draw a circle using a permanent marker. I used a permanent marker because washable markers and dry erase markers didn't show up well on the containers and they rubbed off easily. 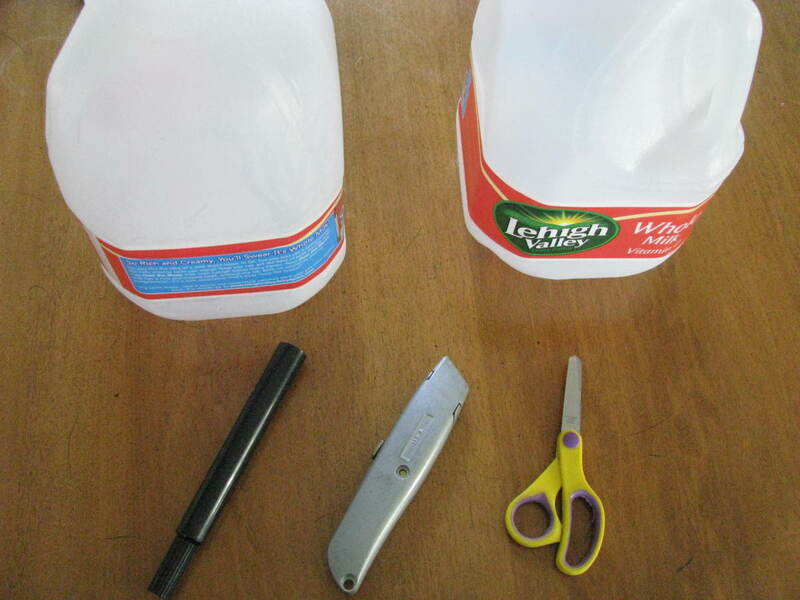 Step 3: Using a utility knife, puncture the container along the circle lines. Make the puncture wide enough to fit the scissors in. Use the scissors to cut out the rest of the circle. Recycle the circles. Step 4: Attach string to the container. In one of mine, I made a small hole in the lid and pushed the knotted end of the string through the hole. 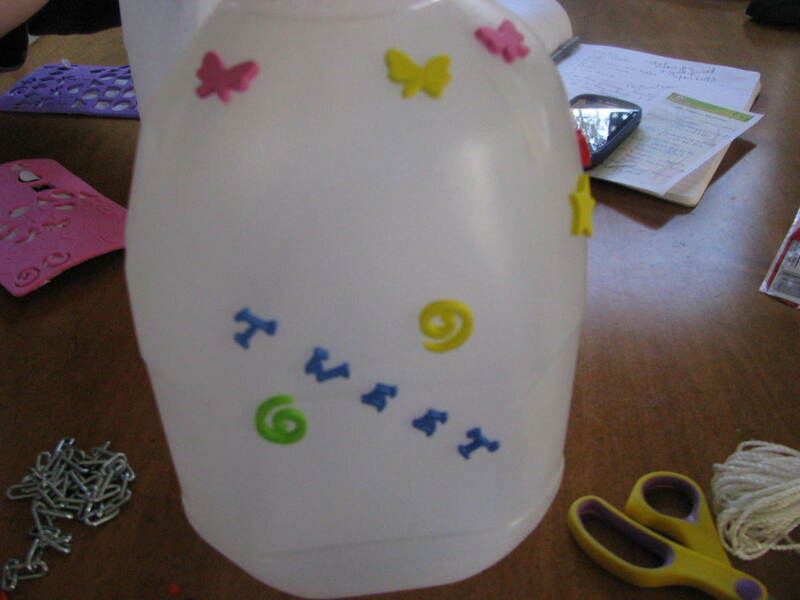 I glued the string to the inside of the lid and then glued the lid onto the container. For the second container, I simply tied the string to the handle. Both will hold up well. Step 5: Decorate! 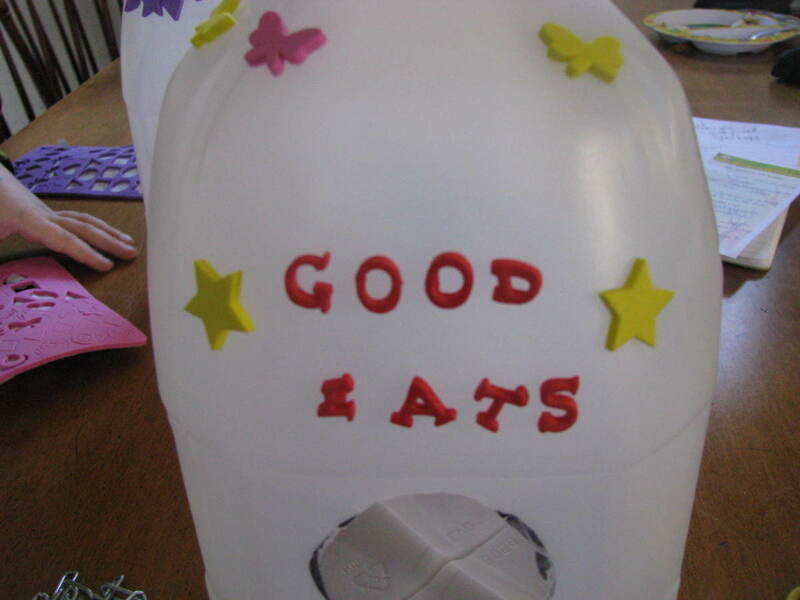 We used foam stickers to decorate. They stay on well and don't come off in the rain. You can use non-toxic markers, paint or other kinds of stickers to decorate, but your feeder may need to be kept in a covered area of your yard, such as on a porch, to keep it dry. Step Six: Fill the bottom of the container with birdseed. Don't use too much; the birds only eat a few seeds at a time and you could end up wasting the rest of the seed when you need to clean the container. For the birdseed, we used a wild birdseed mix, but you can use any kind to attract the birds you'd like to see. Step Seven: Find a place to hang your feeder. We chose two tree branches just outside of our fence (there's a small wooded area next to our house) where we could see them from our living room and kitchen windows. They're also out of the reach of the kids and the dog, which is important if you want to attract the birds and not scare them away. Make sure the containers are completely dry. If not, the seed can get moldy. Do not allow kids to use the utility knife! 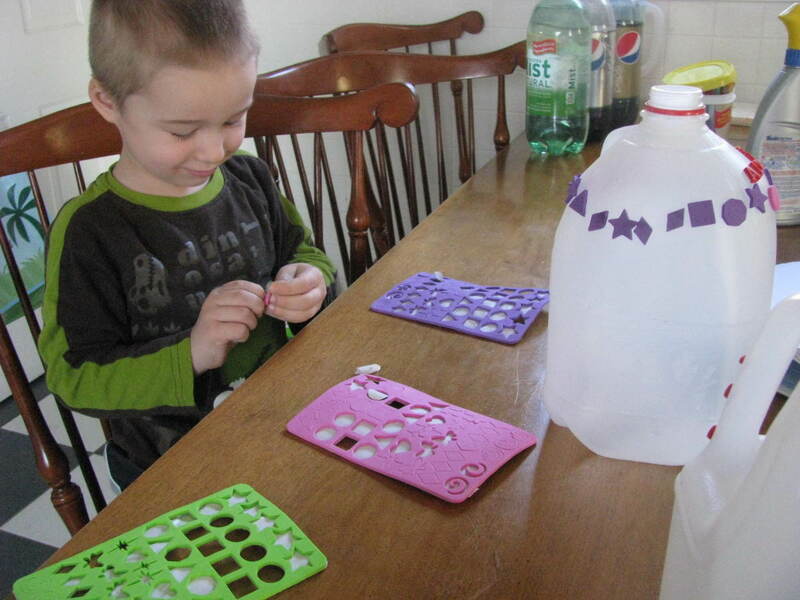 Dependent on age, kids can use the scissors to cut out the holes. We used foam stickers to decorate, of which I had extra from a different project. You can use markers, paints or other kinds of stickers, but just make sure they are non-toxic to birds! Clean the container and change the seed once a week to keep it fresh. Again, make sure the container is dry before adding more seed. Also, it's only necessary to fill the bottom of the container. Anything more might end up wasted. Do you know the birds that are common in your area? Yes, and I can name each one based on certain characteristics. Yes, but I have a hard time identifying them as I see them. No, but I would love to learn more. Bird Watching: What Birds Visit Your Feeder? It's a lot of fun for the kids to watch the birds eat from the feeder, but as a bonus for parents, it can be educational as well. Simply pointing out the different shapes and colors of the birds can be educational. Pointing out how the birds eat and interact with eat other can be educational as well. Even more educational for kids would be to name the types of birds that visit your feeder. After we set our feeders up, my son and I would sit in the windows and take pictures and videos of the birds that visited. We took the pictures and compared them to pictures of birds we found online. We have learned that our feeders have attracted American robins, blue jays, a house finch, and lots of chickadees. It's great to hear my son, a three year old, name the birds now as he sees them in the feeders! 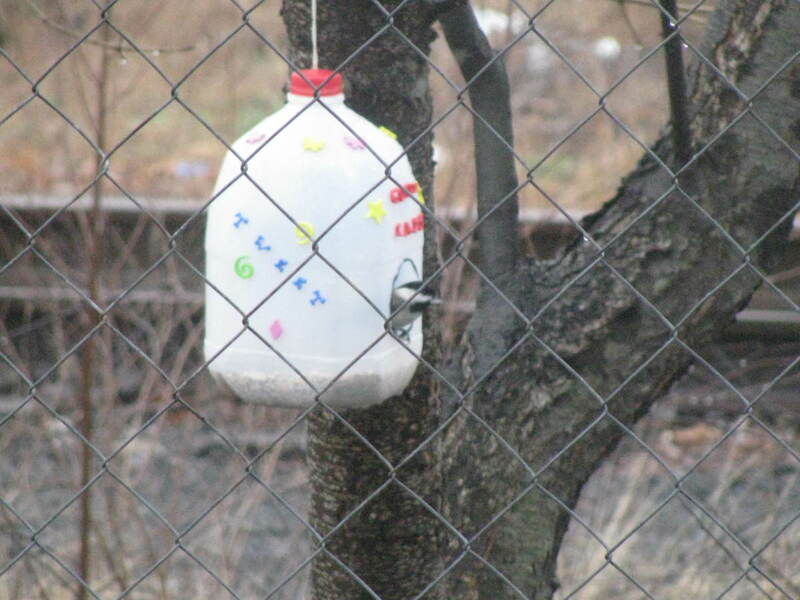 Nice way to use up a couple of empty plastic jugs and help the birds survive. I love this video. 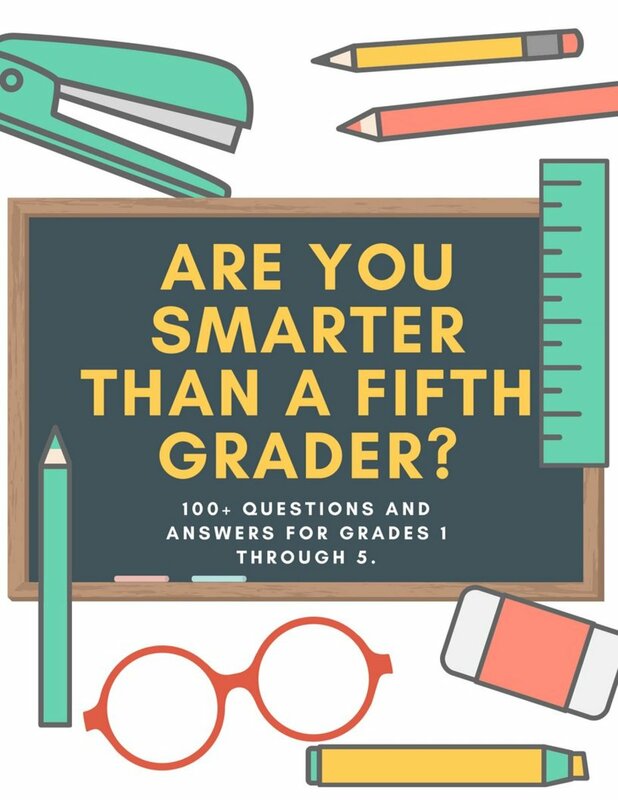 I will definitely be trying this project with my children this spring! johnakc, glad you like it! Thanks for stopping by! Nice idea, I like it..
IzzyM, thank you so much! 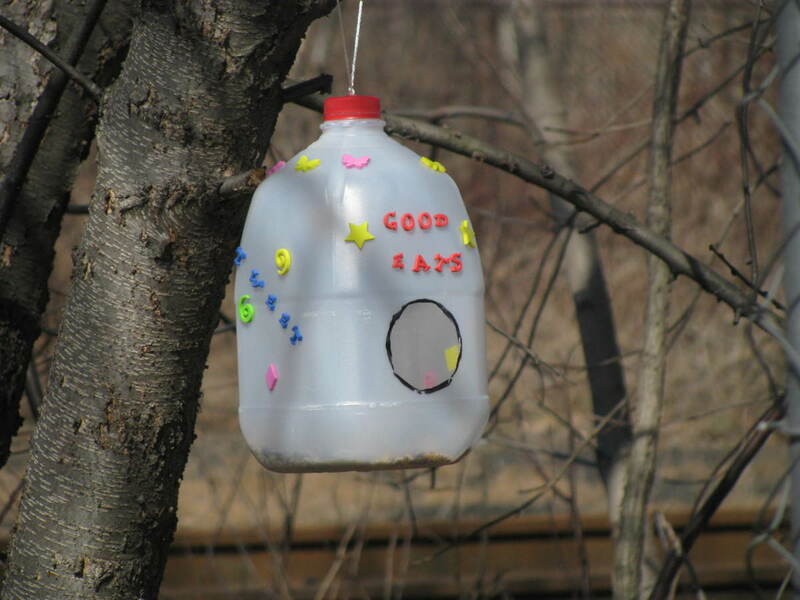 I made a ton of bird feeders like that as a kid; I think I learned it in Girl Scouts. It's a fun project to do, especially for kids. It took me a day of sitting in front of my computer to learn how to make the videos to post them online. I just wish the actual video included in this one didn't include a screeching toddler in the background, but that's life! 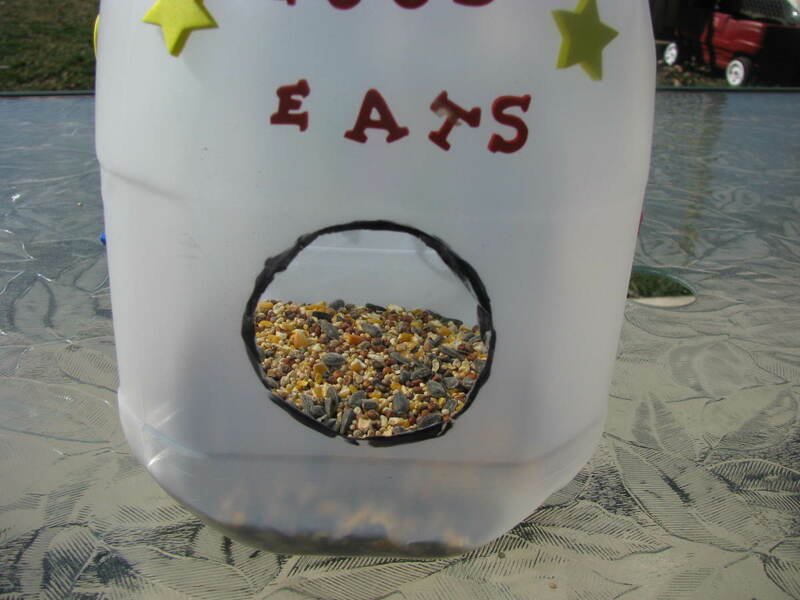 Loved the idea on how to make a simple bird feeder! I could learn a thing or two about making videos from you too. Great job! teaches12345, I too love the cardinals. I agree about teaching kids the importance of caring for other creatures. My son loves to watch the birds and 'help' them with their food. :) Thanks for watching! 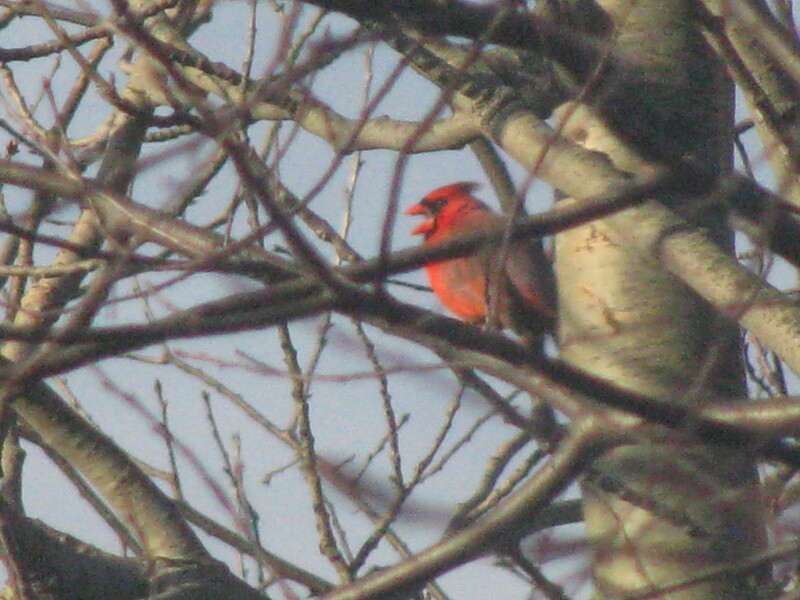 I just love the photo of the cardinal in the tree. They are such pretty birds to watch and hear sing. This is a great craft for children to help make as it also teaches them the importance of caring for our little bird friends. Great sharing! Good idea, you did a great job on the video.